But as comfortable and practical as his bateau might be for canal touring, it’s a far cry from the vessels Len used to sail across the deep blue and the one he is building down in Queensland on the other side of the planet. Len, who has a full head of gray hair and a nicely trimmed beard, was wearing metal-rimmed glasses and a casual shirt with an unbuttoned collar, and he smiled into the camera as he spoke. There was that nagging Skype delay and the echo, but he came across loud and clear. He struck me as eloquent and outgoing, but truth be told I also thought that much of it was a stiff upper lip. You know, the Anglo-Saxons’ uncanny ability of putting on their best face during the worst of tragedies. For Len, 66, and Marion, 72, lightning struck out of a clear blue sky in early April 2010 when their son died in a freak accident on the Caribbean island of St. Martin. At age 38, Peter, or “Spike,” as his mates called him, was one of the most colorful and sought-after professional sailors. He’d raced around the world and stared down the dangers of gales and icebergs in the Roaring Forties and Screaming Fifties. 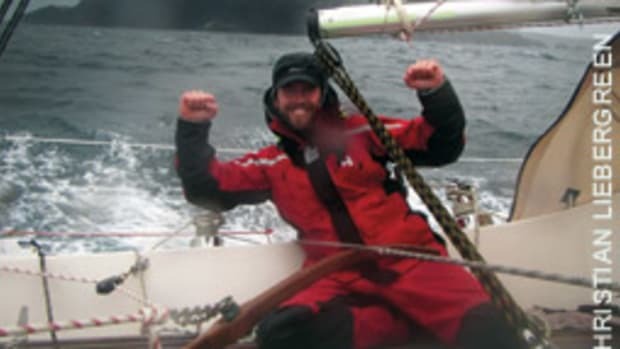 He was in the famous Sydney Hobart Yacht Race 21 times and crewed on several winning boats. 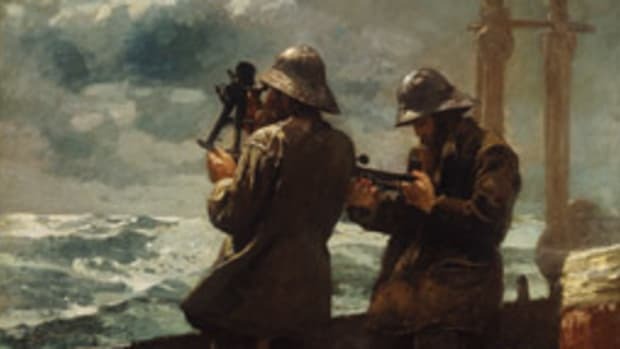 He had scrambled up rigs and helped out on pitching, slanting and bucking foredecks during epic storms too often to count. He was at the top of his game. Confident, strong and seemingly invulnerable, he lived his dream. But in a bitterly ironic twist of fate he slipped and fell in a hotel shower, hit his head and died of brain trauma. Later, he fondly watched Peter, who was diagnosed with dyslexia as a child and attended special schools, go on to bigger and better things as he built a career as a professional crew and a sailmaker with North Sails. But that was then. Now it’s about healing and coping with the loss of their only child. And, by the look of things, this process involves building a boat that will feature many ideas developed by and with Peter, who was a married father of two young children. Parents usually pass their legacy to the next generation to honor it, run with it — or bury it with them. But now it’s up to Len to complete a dream his son helped start. In 1995, Peter was on Terra Firma, a sweet-sailing Murray 41 that won the Sydney Hobart by handicap on her first try. 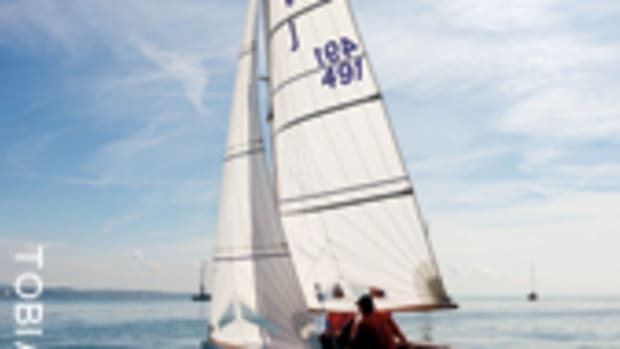 She continued her successful racing career for several years and inspired Len to design, in his mind, the ultimate cruising boat that does away with all the nuisances that bug him to no end. The design brief was short: must have no “must haves,” must sail well, must be comfortable, must be green. Now, go figure. And that’s exactly what they did. As a racer, Peter couldn’t have cared less, but he took an active part as a sounding board for Len’s ideas and provided valuable counsel. He also was going to make the sails. “Good sea boats are terrible to live on when they’re not sailing, which is about 90 percent of the time,” Len says. What irks him, in no particular order, are uncomfortable furnishings, through-hull fittings, diesel engines and holding tanks. 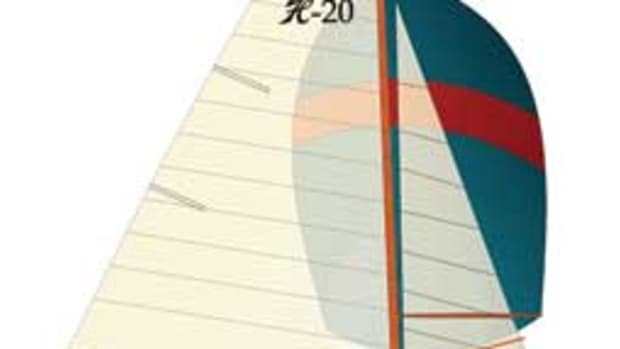 To him, a junk rig is the epitome of easy, especially for single-handed sailing, because it is so simple to adjust the sail area to the conditions and not have to worry about expensive furling systems, etc. 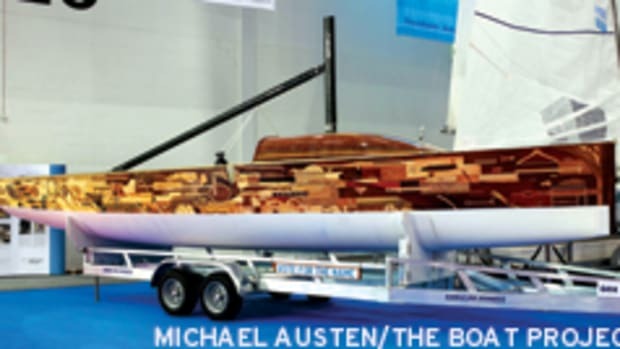 The inspiration came from Jester, Blondie Hasler’s boat, which combined the seaworthy hull shape of a Nordic Folkboat with a junk rig to challenge Sir Francis Chichester in the first Single-handed Transatlantic Race in 1960, and from Joshua Slocum, who praised the junk rig of Libertad, which he sailed from South America back to the United States. Len also mentions a steel-hulled and junk-rigged Herreshoff 44 that he admired in Brisbane for her lovely lines and elegant simplicity. To further refine these ideas, he consulted with Colin Clifford of Compucraft in Brisbane, who put their ideas into drawings. The result is called D’autre part, French for “on the other hand,” meaning there is an alternative to common thinking. The chosen materials are steel for the hull and aluminum for the deck. To keep electrolysis in check, Len says, he’ll use Triclad, a structural transition joint made of seawater-resistant aluminum alloy and C-steel that is applied as a strip or pad when welding aluminum and steel. “I didn’t want a real cockpit,” he explains, “just an aft terrace that has no cumbersome built-in furnishings. Just a wide-open space of 14 feet by 14 feet that can be set up with folding chairs and tables from two deep lazarettes when needed.” Renderings show that, yes, you could park a tiny Smart car there, too, which promises to be très bien for zippy side trips to the countryside. The Dorieans stayed outside the box with other ideas as well. 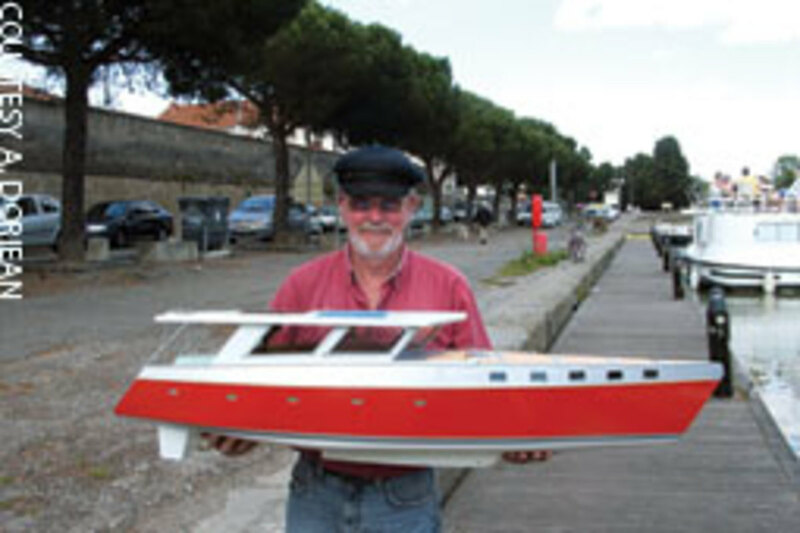 To achieve a shallow draft of 3 feet that allows this 50-footer to be beached and get into the French canals, it’ll pack ballast inside a stubby keel. 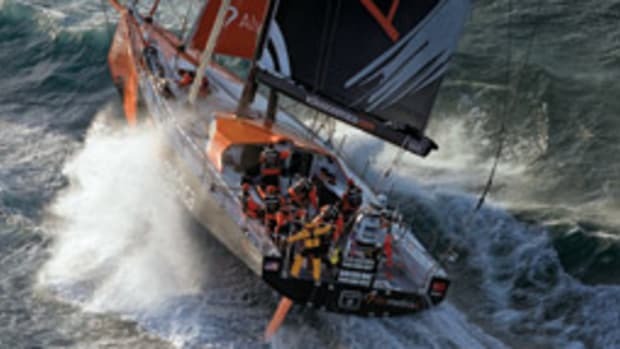 For lateral resistance there will be two daggerboards, similar to those on the boats that will compete in the Volvo Ocean Race. And for propulsion Len’s wish was to go electric with two ST 37 systems by Solomon Technologies that will take advantage of the vessel’s motion, which spins the freewheeling props on long downwind passages, charging 14 140-amp-hour Lifeline batteries that reside deep in the bilge as part of the vessel’s ballast. In addition to this kind of “regenerative sailing,” Len will mount some solar panels to help cover the boat’s modest house loads, which include a 12-volt DC fridge. Not so modest is the size of the dinghy Doriean has in mind. “Gotta be a real boat,” he insists, none of those 8-foot rinky-dink dinks that won’t go anywhere and are a bear to hoist onto the deck. 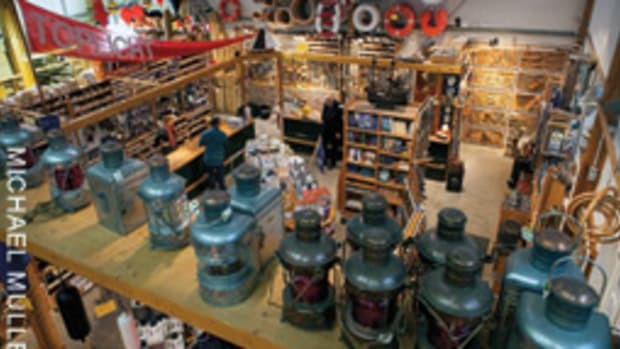 His solution: a dinghy garage in the stern that swallows the implement lock, stock and barrel. 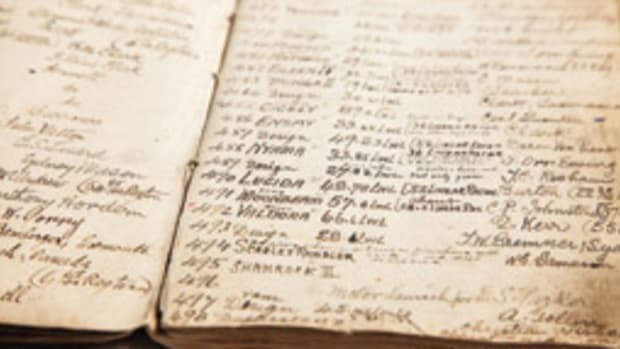 Another thing he does not like is through-hulls, which most sailors have learned to accept as “must haves,” even though they spell trouble if they ever decide not to work as advertised. Eliminating them requires the use of composting heads and pumping gray water out over the watertight stern bulkhead, both of which Len stipulated in his design brief. To find some diversion from the grief over their fallen son, Len and Marion are traveling and spending time with relatives. “I don’t think I’ll ever get over it, even as we try and carry on with our lives,” Len says. But he also knows that to get on with his life he has to get on with D’autre part, which at present consists only of a steel hull and awaits his return to Queensland. Len also had a working scale model built that he has been showing off. “Launch late next year, at the earliest,” he estimates. That’s a ways off, but when she goes into the water she’ll bring to life many of the ideas that father and son sketched out together. Perhaps Len will be able to sell the concept to a yard that’ll issue a production model of D’autre part. It could be an innovative shot in the arm for bluewater cruising boats. And it most definitely would help Len and Marion honor the legacy of Peter, who lived the dream until the end. To contact Len about the D’autre part project, e-mail merrigan@bytesite.com.au.